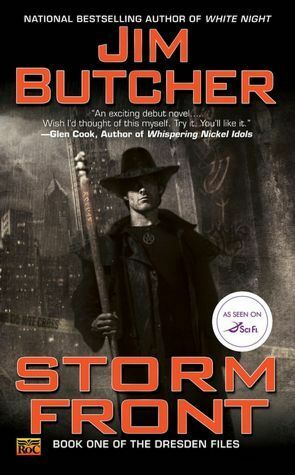 Storm Front is book one in The Dresden Files by Jim Butcher. I had my first taste of Harry and The Dresden Files series, when I read a novella in an anthology. My interest got piqued and I’m finally picking up the books. I enjoyed learning about Harry and having the story in his POV. Having a wizard and male protagonists was unique. It’s not common in Urban Fantasy and this was my first taste of this. The murder mystery was fascinating and became a catch twenty-two for Harry. The magic and world building shows promise, but I felt a little lost at times and some areas needed more explaining and development. We get some secondary characters like Murphy the detective and Susan the reporter. I liked Murphy, but didn’t like Susan. This story is fresh and unique even with it being an older series. That’s saying something about the series and world. I’m glad I’m finally trying this one out and I’m look forward to the next adventure with Harry. I’m really glad you started this series. It is so much fun and only gets better. I had someone make a snide remark to me when I commented about the Iron Druid series had a male MC that doesn’t exist much in UF. They said there was a ton of them. I think I read like four (Dresden Files, Heartstrikers, Iron Druid and Fred, the Vampire Accountant). Great review. I hope you keep enjoying this series as much as I have. I’ve only found this series The Dresden Files that has a Male Protagonist. It’s not common. Their is always going to be someone out their that will make a snide remark about something. We just take it and move on. I’m going to have to look into the other series you listed. I haven’t heard of them, maybe the Iron Druid, but it’s not ringing any bells. I need to pick up book two and read it. I very much enjoyed the mystery and Harry. I found it refreshing to have lead male. Thank’s for stopping bye. Always great to hear from you. This is on my keeper shelf. I even have Backup which is hard to find. Love the humor in it and the action is never ending. Rereading this series never gets old either. That’s great Tammy. I’m glad I finally picked up the first book in this series. It surprised me and Harry was great. Loved the humor and action. Thank’s for stopping in and checking out my review. Tanya, it’s definitely an adult series, though there’s not really anything that would be inappropriate for teens, especially older ones. HAHA I know what you mean. Lots of readers have raved about this series and I’ve seen it several reviews, so I thought it was time to give it a try and I was surprised with how much I enjoyed it. I wasn’t sure if I was going to like Harry, a male protagonist, but he surprised me. Lots of humor and action. Very unique and fun! I’ve got this on my TBR. Is it adult or YA? I’ve seen a lot of families letting their children read this series so I wasn’t sure. It would definitely be different to have a male protagonist. We dont’ get a lot of that in the genre. No we don’t get a lot of male protagonist. It was different to read it that way. I’d say adult. Teens could read, but not younger. It was impressed. I just need to get through my review books before I can get back to library books and the next one in this series.